Adjustable Hydraulic Series shock absorbers offer the most flexible solutions to energy absorption application requirements when input parameters vary or are not clearly defined. By simply turning an adjustment knob, the damping force can be changed to accommodate a wide range of conditions.Enidine offers the broadest range of adjustable shock absorbers and mounting accessories in the marketplace today. The Enidine OEMXT Series provides a low profile adjustment knob offered in imperial or metric thread configurations with stroke lengths of 25 to 150 mm for drop-in competitive interchange. Low Range (LROEMXT) Series products are also available to control velocities as low as 0,08 m/s and propelling forces as high as 17 790N. OEMXT and OEM Large Series shock absorbers are fully field repairable. characteristics, resulting in the lowest reaction forces in the industry. • ISO quality standards result in reliable, long-life operation. • Fully field repairable units are available in mid-bore and larger bore product ranges. Constant orifice area damping (dashpot) provides the largest shock force at the beginning of the stroke when impact velocity is highest. These shock absorbers provide high-energy absorption in a small, economical design. This type of damping is also available in adjustable shock absorbers. eight (8), while minimum damping force is achieved by turning the adjustment knob to zero (0). Turning the adjustment knob causes the adjustment ball to increase or decrease the clearance (orifice area) between the ball and its seat, depending on rotation direction. The internal structure of an adjustable single orifice shock absorber is shown above. When force is applied to the piston rod, the check ball is seated and the valve remains closed. Oil is forced out of the high pressure shock tube chamber through the orifice, creating internal pressure allowing smooth, controlled deceleration of the moving load. 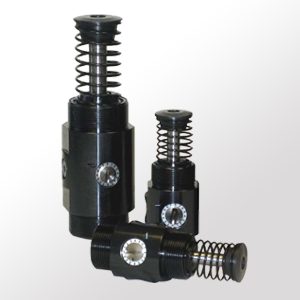 When the load is removed, the compressed coil spring moves to reposition the piston head, the check ball unseats, opening the valve that permits rapid piston rod return to the original extended position. The closed cellular foam accumulator compensates for fluid displaced by the piston rod during compression and extension. Without the fluid displacement volume provided by the foam accumulator, the closed system would be hydraulically locked. This type of orifice design results in. Conventional damping allows linear deceleration by providing a constant shock force over the entire stroke. This standard design is the most efficient, meaning it allows the most energy to be absorbed in a given stroke, while providing the lowest shock force. This type of damping is also available in adjustable shock absorbers. The adjustable multiple orifice shock absorber is similar to the principles described earlier. The check ring replaces the check ball and the adjustment feature uses an adjustment pin instead of an adjustment ball. The damping force of the shock absorber can be changed by turning the adjustment knob. Maximum damping force is achieved by turning the adjustment knob to eight (8), while minimum damping force is achieved by turning the adjustment knob to zero (0). Turning the adjustment knob rotates the adjustment cam within the shock absorber. The cam, in turn, moves the adjustment pin in the shock tube, closing or opening the orifice holes. by closing the orifice holes, the total orifice area of the shock absorber is reduced, thus increasing the damping force of the shock absorber. The adjustable shock absorber enables the user to change the damping force of the unit, should input conditions change, while still maintaining a conventional-type damping curve. Low velocity range (LR) series configurations are available for controlling velocities that fall below the standard adjustable range.